So we moved. Click here if you missed that craziness. To use the space more effectively, we decided to double up the shelf space. 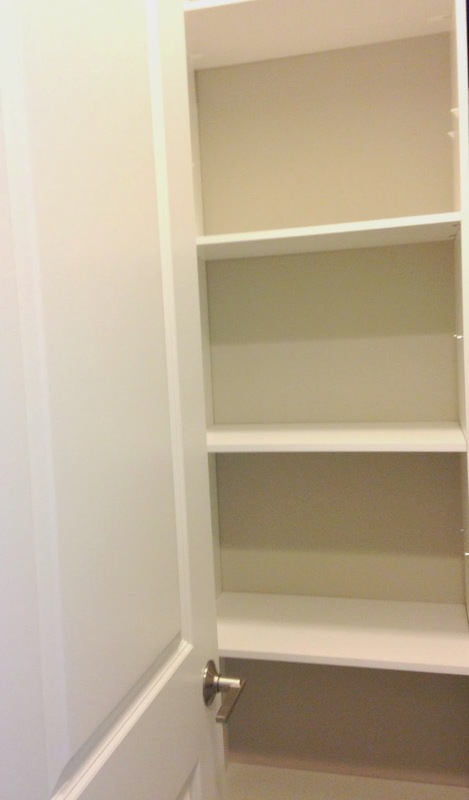 AH (Awesome Husband) cut white laminate shelves to fit. My DAD (Do Anything Dad) showed me how to iron on laminate edging. (That iron on edging is pretty spiffy!) 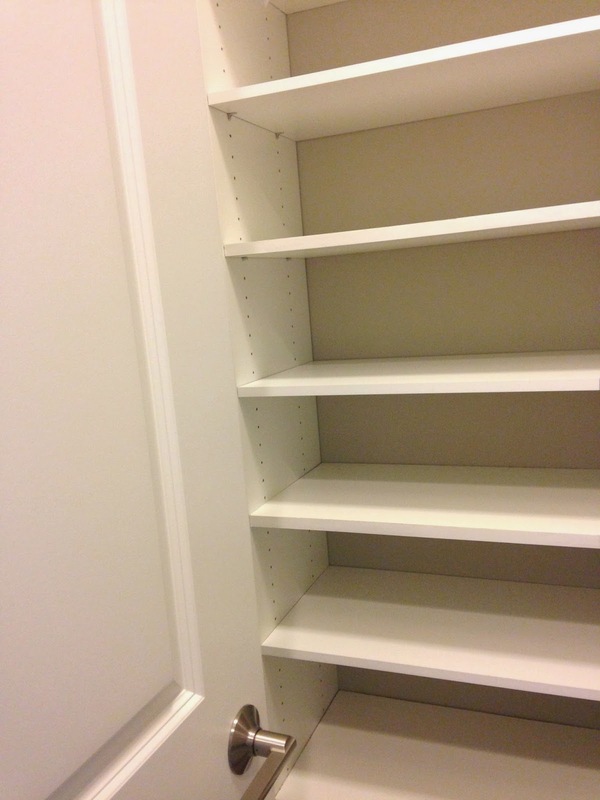 Now, I had shelves I could work with! 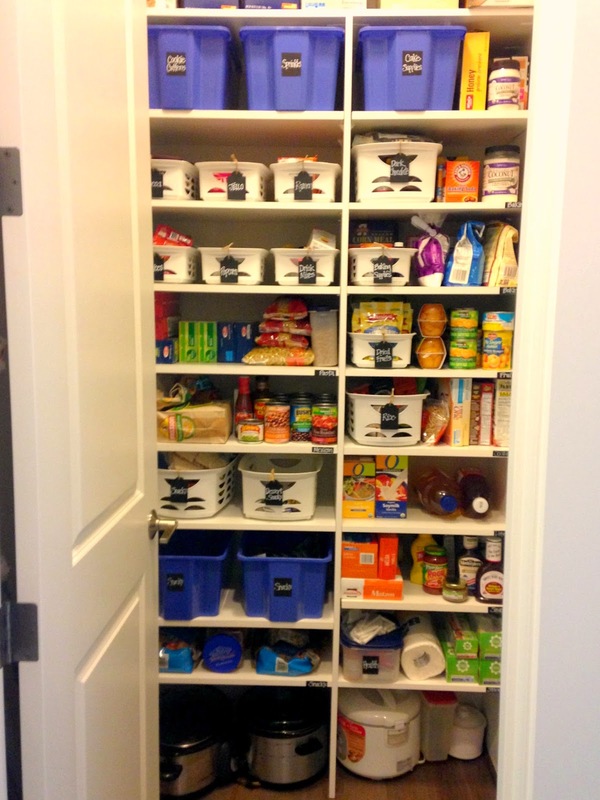 The first thing I did was organize my food items into categories, then, I divided my space into sections based on those categories. I needed a fool-proof system that would work for my whole family. 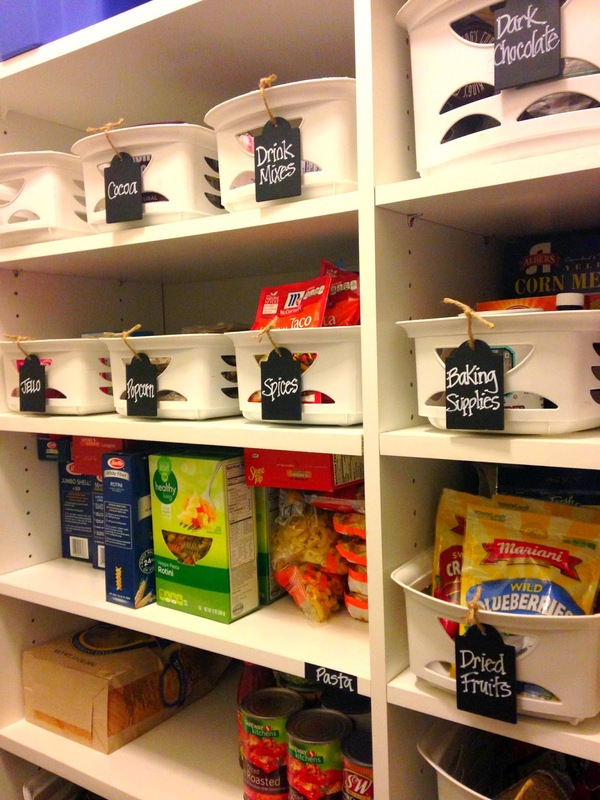 I had quite a few old, white Sterlite bins lying around, so I used them all and added chalkboard tags with twine. 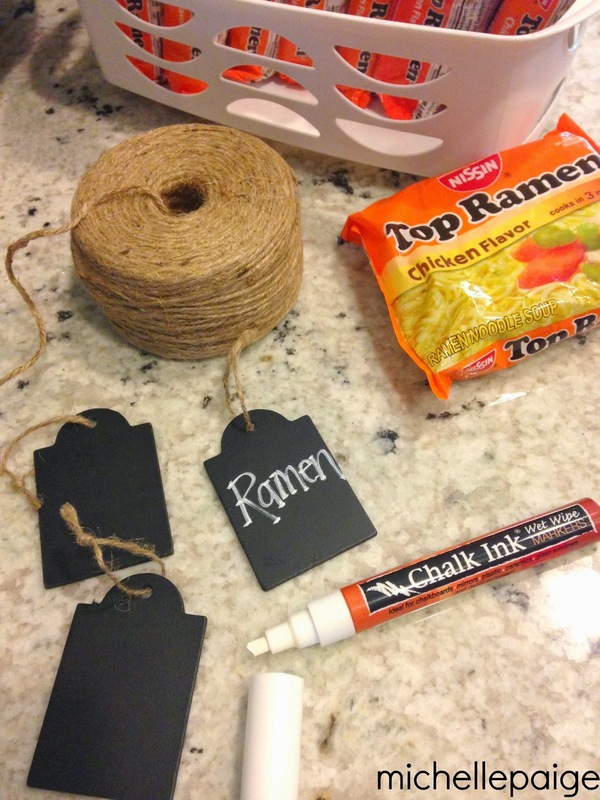 I found the tags at Michaels. 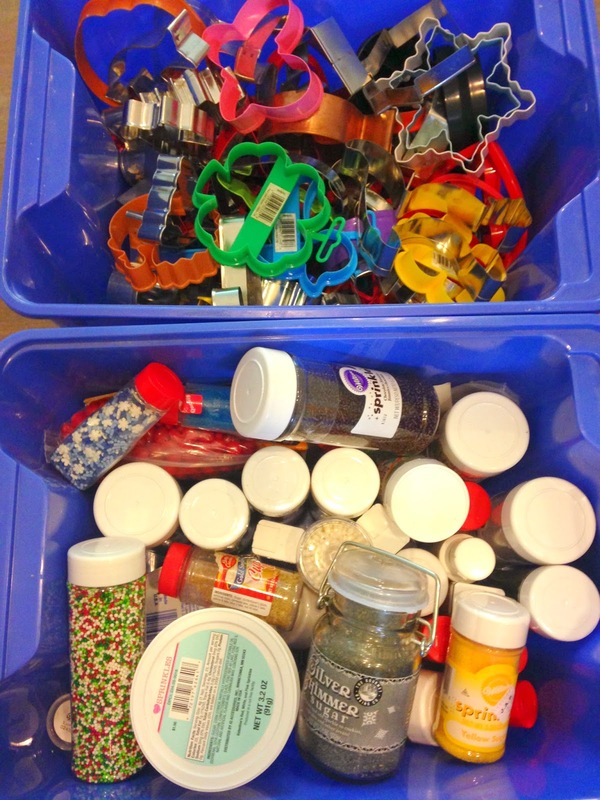 Small items that I had multiples of, went in the white bins. 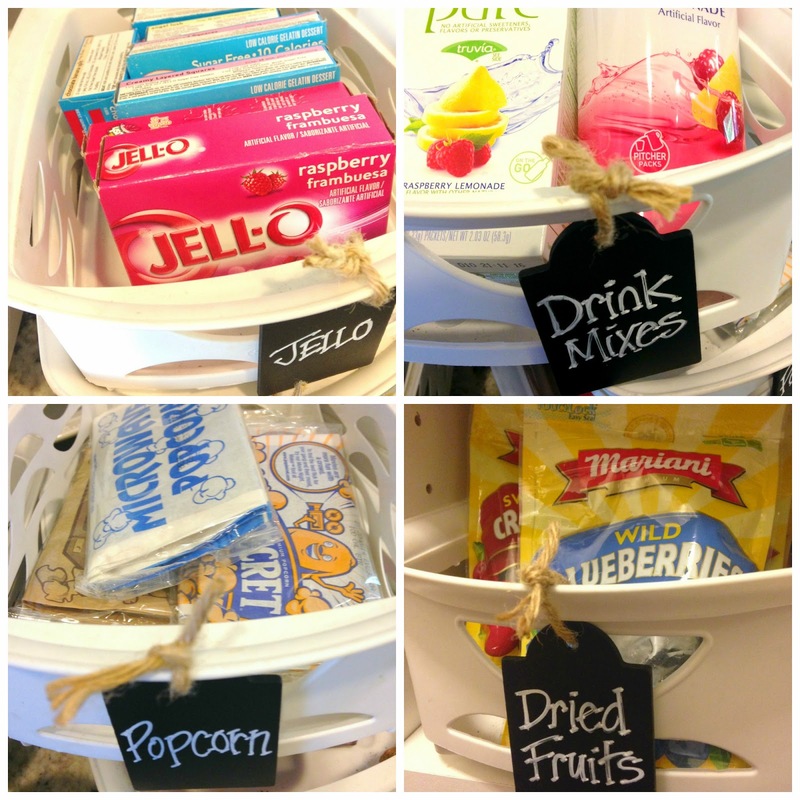 Things like drink mixes, jello, cocoa, spice packets, popcorn, Top Ramen and even dark chocolate! I'm sure you have a dark chocolate bin in your home, don't you? What? You don't? Well, you're missing out...on a few hundred calories, that is! 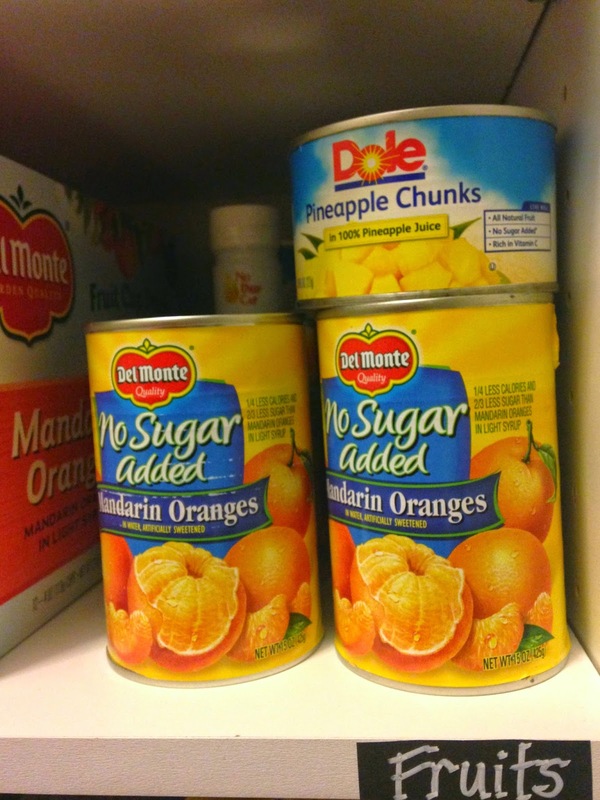 My pantry is always changing. New foods come in, old foods get eaten, products change, recipes change, new eating patterns emerge depending on the season...hopefully healthier habits as the season changes. 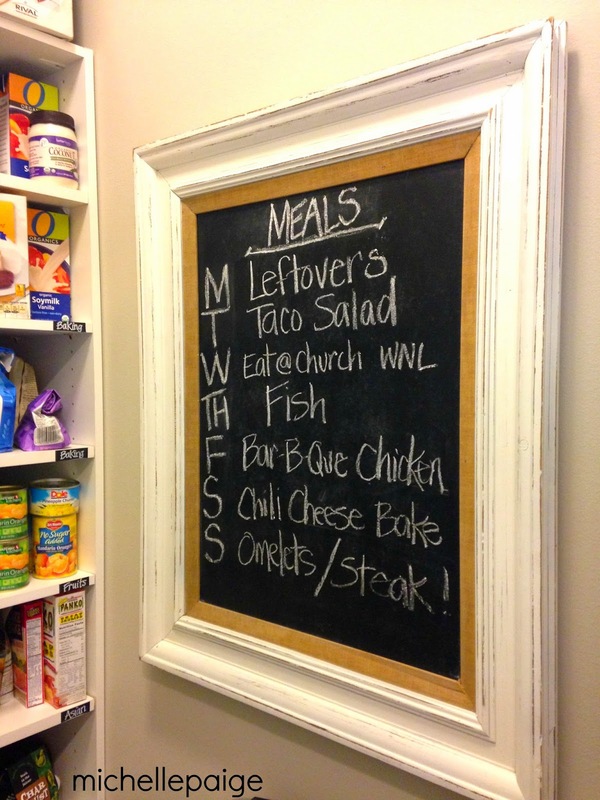 That's the beauty of a 'chalkboard' pantry. 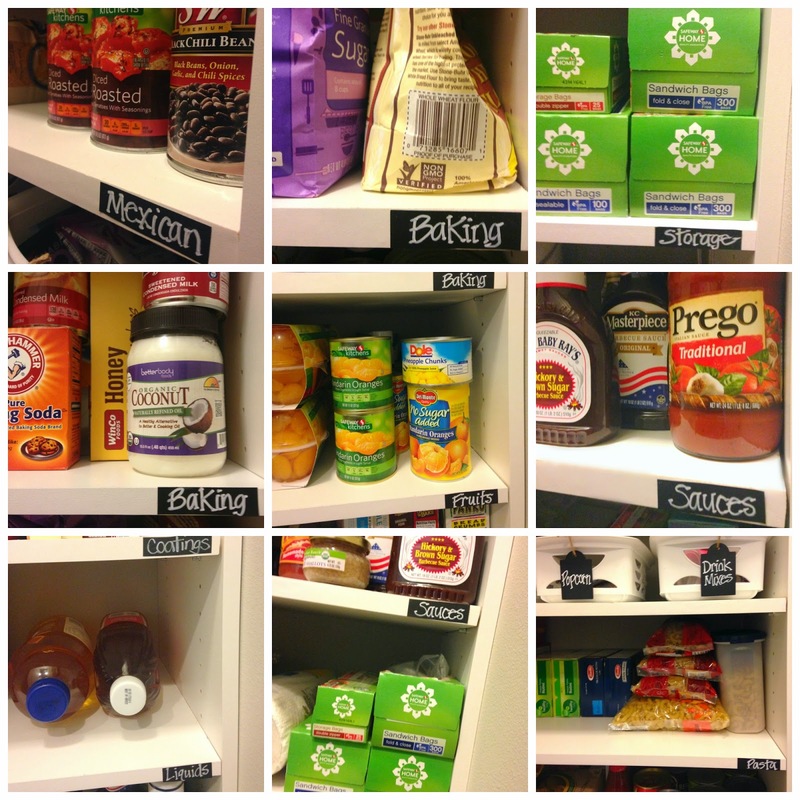 All labels can be wiped clean and re-labeled when needed. Got to love the flexibility of that! 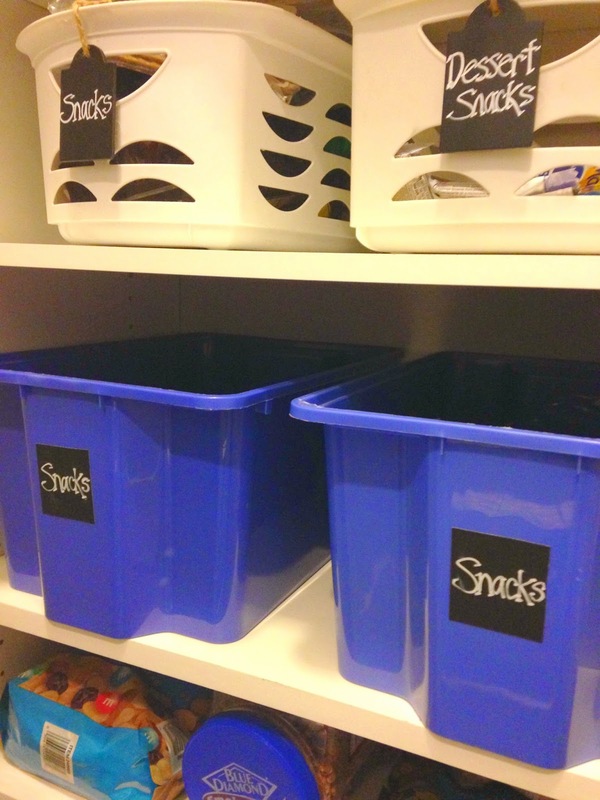 I quickly ran out of white bins, so I used some leftover blue IKEA bins that I had. Cookie cutters and sprinkles needed their own bin, so did some of the snacks for the kid's lunches! 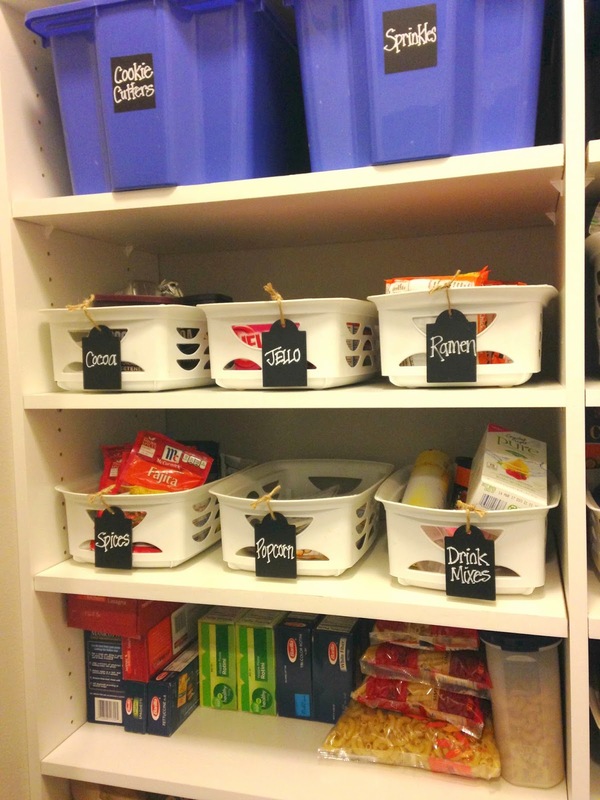 I also labeled the laminate shelves. 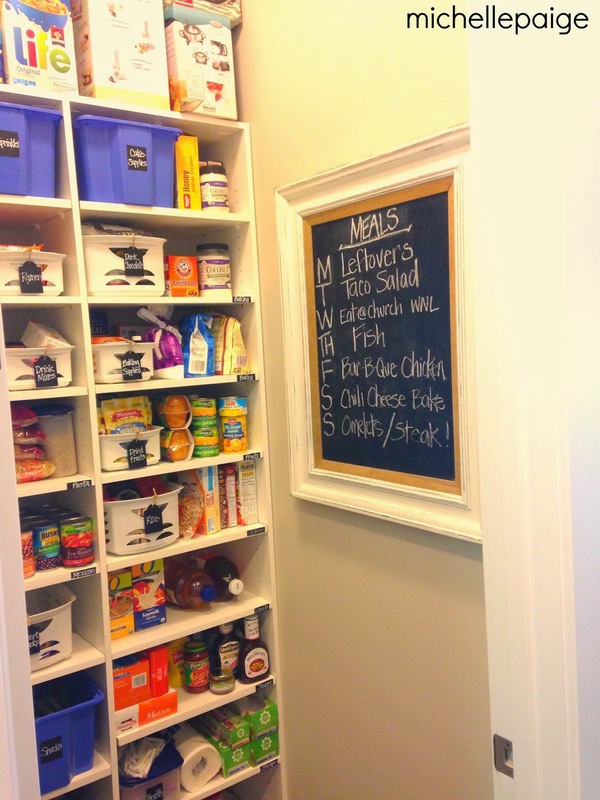 This was easy to do using Self-Adhesive Chalkboard Liner. You can cut the vinyl into any sized shape you need. 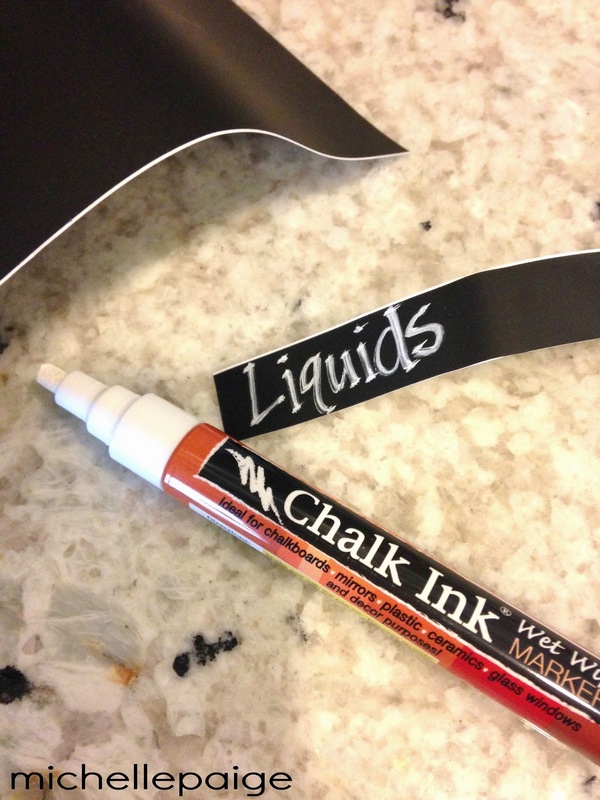 I used this Chalk Ink Marker to write on the tags. Because of the high ceilings, I can go as tall as I can reach on my handy step ladder. Costco size boxes of dry cereal and fondue pots are being housed here currently. Storage of crockpots on the bottom. One important item we keep in our pantry is throat lozenges. 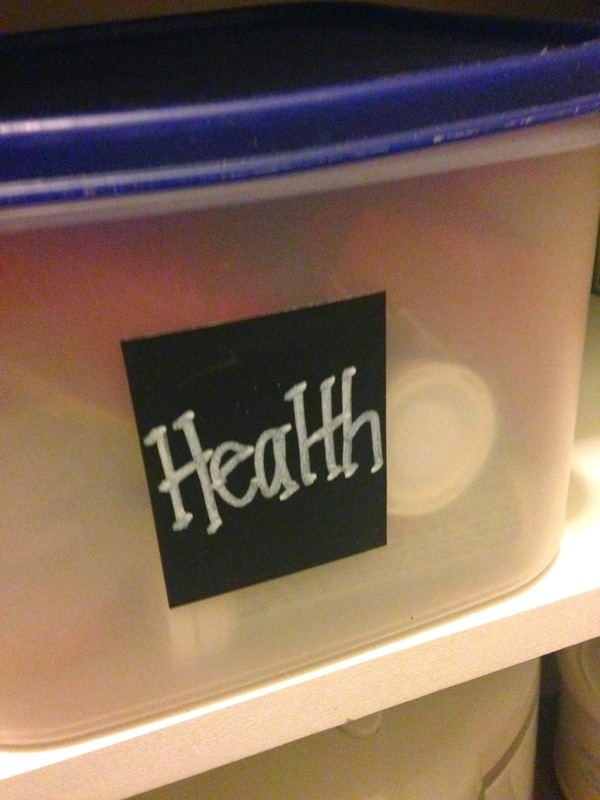 I keep cough drops and Airborne drink mixes in a container labeled health. This allows any member of the family who has a sore throat, to take a few cough drops with them throughout the day. 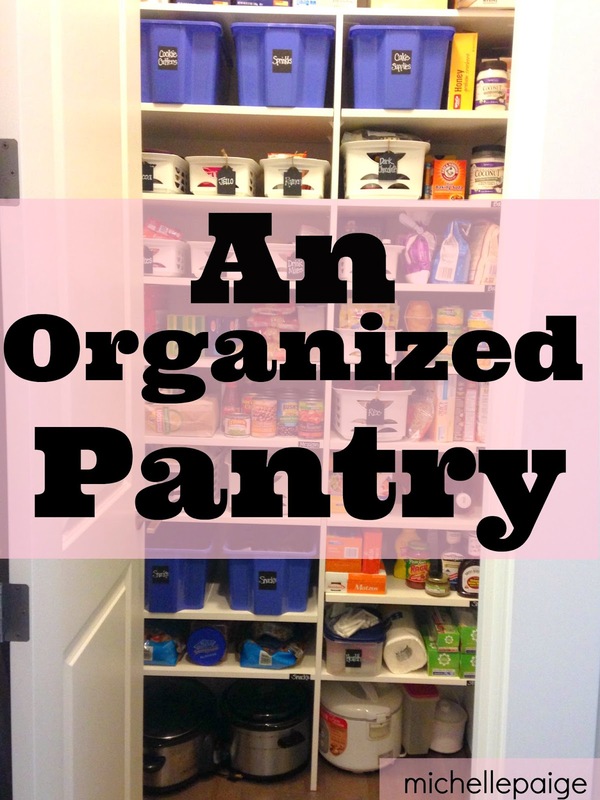 So there you have it...Our Organized Pantry. Now, about those rustic baskets I've been dreaming about... like these Storage Baskets and these Lined Baskets and these Locker Style Storage Baskets. A girl can dream, right? 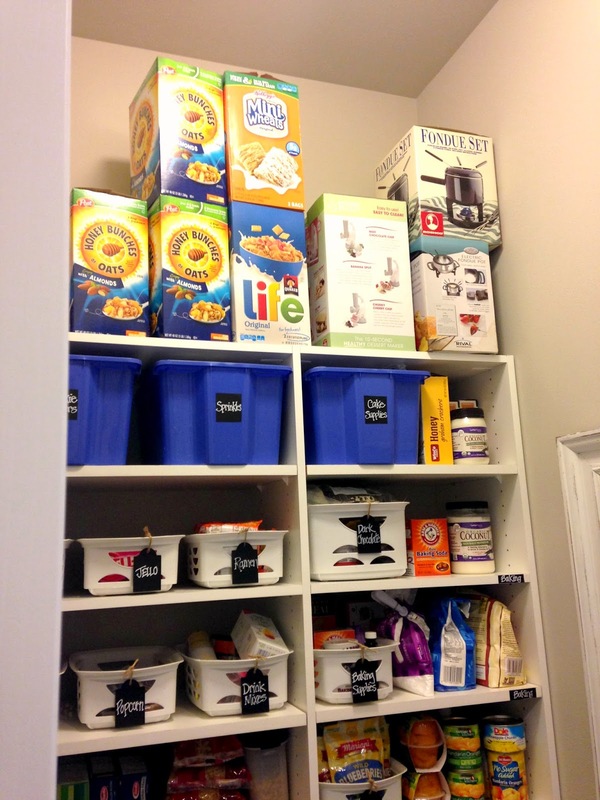 I have always wanted to create an organizing storage system for my pantry and I utilize plenty of bins and boxes as well. However, the labeling process is not as efficient as yours since I need to replace the stick-on labels each time I change the contents. 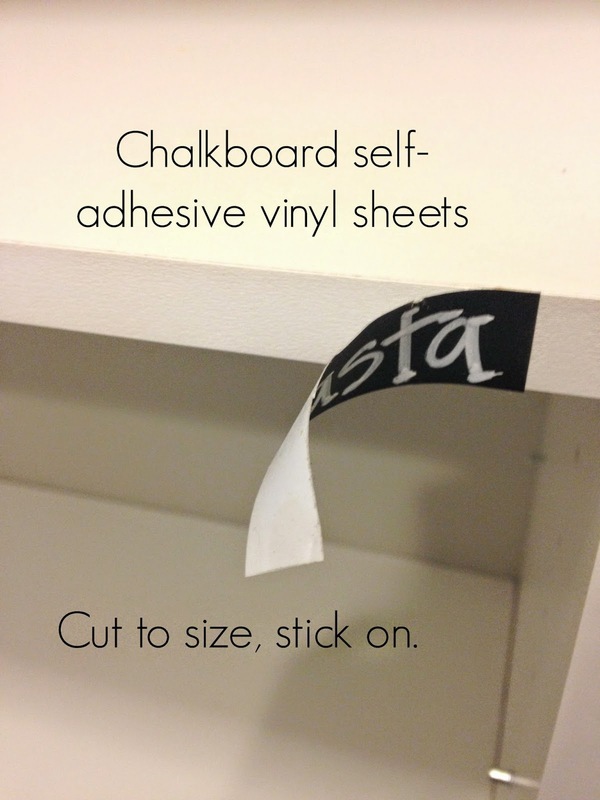 The chalk labels are much more cost-efficient and reduce time as well.